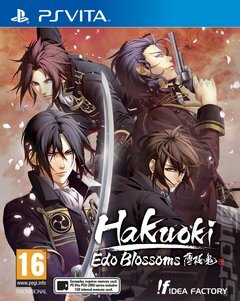 This remastered telling of the beloved visual novel Hakuoki series is a continuation of the Hakuoki: Kyoto Winds story and focuses on the story set in Edo, the second part in this two-part series. The young Chizuru, determined to find her father, will romance the famous warriors of Shinsengumi through a series of engaging stories and dramatic events. Now, experience new characters, love interests, and episodes in the world of Hakuoki: Edo Blossoms! It was a bittersweet homecoming for both Chizuru and the warriors of the Shinsengumi, as the city of Edo resembled very little of its former self, engulfed by the harrowing winds of change that were sweeping through the country. As the Shinsengumi s survival came under threat, they were faced with a choice: discard their principles, or give up their lives. Some of them had no such choice, and they cloaked themselves in darkness to protect the Shinsengumi s greatest secret: the Furies. 12 Charming Bachelors - Start by choosing from one of 12 handsome bachelors and fall in love with Japanese history s most famous warriors. Multiple Endings, One True Love Explore the gorgeous world of Hakuoki through narrative choices that unlock branching storylines and up to 30 different endings.